This is a module called theme_utils that makes it easy to work with themes, as well as making it easy to style UI components with these themes. The module consists of two main parts, but they're in the same namespace. 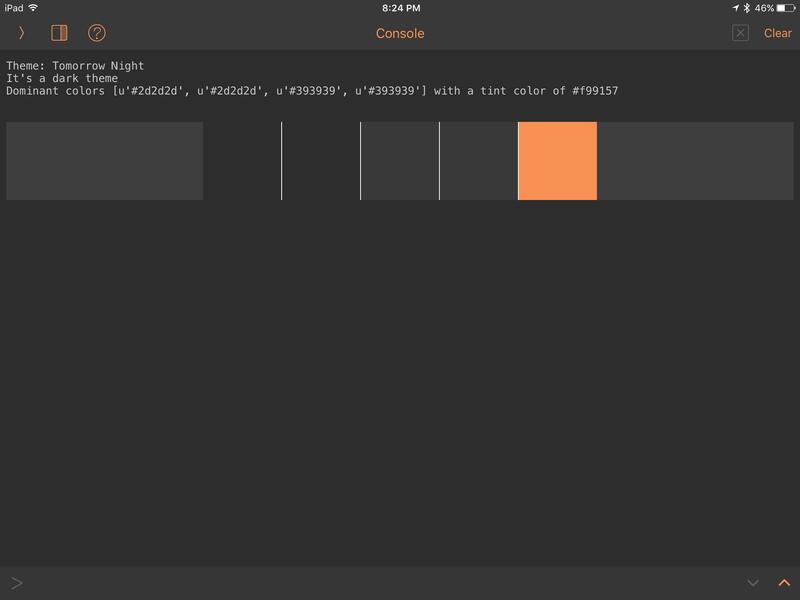 get_color_scheme - return a color scheme to go with the current theme. This consists of four colors, the editor background color, the library background color, the top bar's color, and the color of the backgrounder tabs. These are sorted by "intensity," which is dark to light for "dark themes" and light to dark for "light themes"
Utilities for styling uis to match the current theme. style_ui(view), and view (and its children) will be styled to match the current theme. A few special things are happening in the background here. 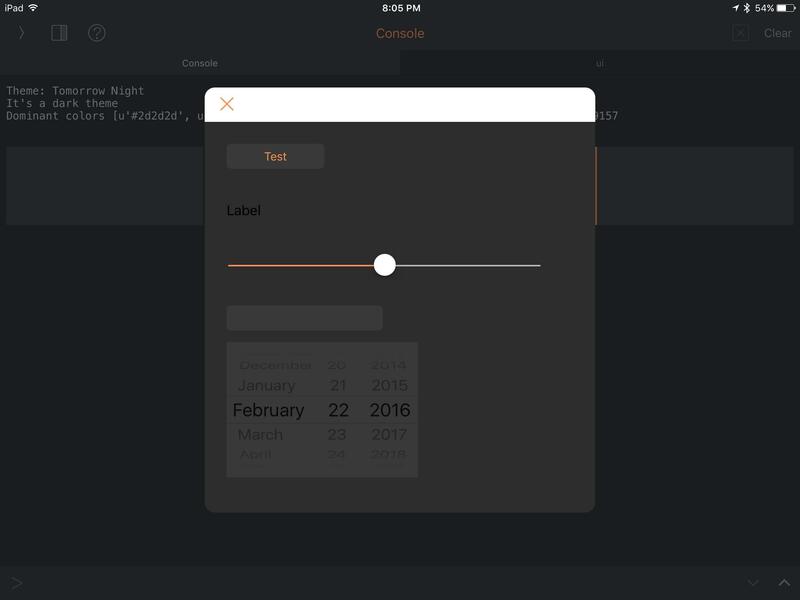 Certain elements, like ui.View, ui.Label,ui.Slider, and ui.NavigationView have their backgrounds set to the "dominant color" (the first in the get_color_scheme). These are elements that either are "background elements," elements which serve primarily as a background for other elements, or are elements whose background isn't a part of the element. The background of a ui.Slider should appear opaque, but the background of a ui.Button or a ui.TextField should appear as part of the element, and therefore in a color that stands out. Because these colors are pulled directly from the themes, in high-contrast themes, this contrast will be more, but in a theme with very little contrast, this contrast will be less. All of these functions work flawlessly with custom themes, built with @omz's Pythonista Theme Editor. The code is here. I haven't include the pyui file I used for testing, but that's easy enough to make yourself. This will likely be merged into Pythonista-Tweaks as part of the theme functionality, but that will be after there is much more control over these things. One thing that seems to be missing is that labels should probably have light text when using a dark theme. 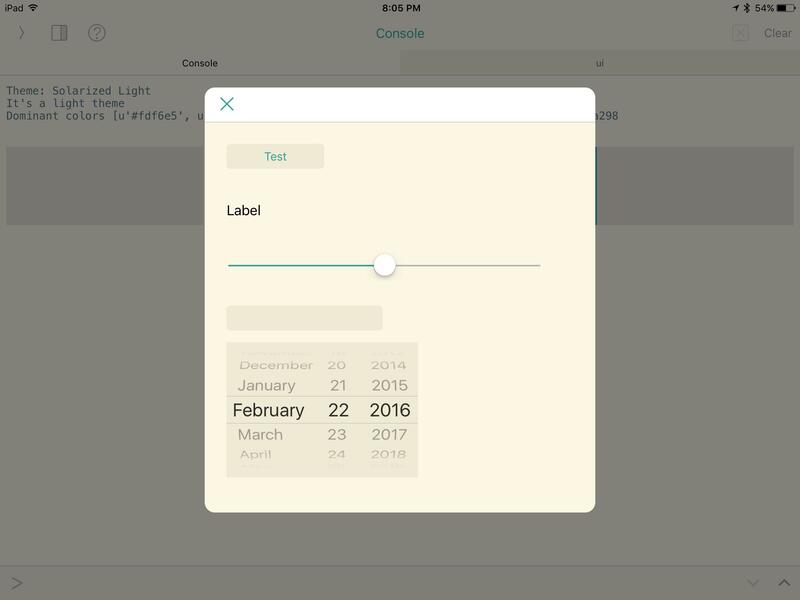 @omz updated, but can't seem to find a way to set the color for a DatePicker.